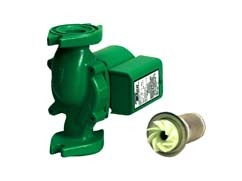 Note: Full flange-to-flange three-year warranty on all 00 Series circulators Performance Data Flow Range: 0-18 GPM Head Range: 0-9.5 Feet Minimum Fluid Temperature: 40 degrees F (4 degrees C) Maximum Fluid Temperature, Cast Iron: 230 degrees F (110 degrees C) Maximum Fluid Temperature, Bronze: 220 degrees F (104 degrees C) Maximum Working Pressure: 125 PSI Connection Sizes: 3/4", 1", 1-1/4", 1-1/2" Flanged Taco 005 Cartridge Circulator is designed for a wide range of residential and light commercial water circulating applications. Unique replaceable cartridge contains all of the moving parts so you can service it easily instead of replacing the entire unit. Compact, direct-drive design and low-power consumption are ideal for high efficiency jobs. Features: Standard High Capacity Output Compact Design Quiet, Efficient Operation Unique Replaceable Cartridge Design-Field Serviceable Direct Drive-Low Power Consumption Self-Lubricating No Mechanical Seal Unmatched Reliability Maintenance Free Universal Flange-to-Flange Dimensions Cast Iron or Bronze Construction Typical Applications Hydronic Heating Add-A-Zone Additions Zoning with Circulators Chilled Water Cooling Domestic Water Systems Tacos 005 Cartridge Circulator is designed for a wide range of residential and light commercial water circulating applications. Compact, direct-drive design and low-power consumption are ideal for high efficiency jobs.